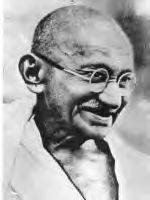 Mohandas K. Gandhi was born in 1869 to Hindu parents in the state of Gujarat in Western India. He entered an arranged marriage with Kasturbai Makanji when both were 13 years old. His family later sent him to London to study law, and in 1891 he was admitted to the Inner Temple, and called to the bar. In Southern Africa he worked ceaselessly to improve the rights of the immigrant Indians. It was there that he developed his creed of passive resistance against injustice, satyagraha, meaning truth force, and was frequently jailed as a result of the protests that he led. Before he returned to India with his wife and children in 1915, he had radically changed the lives of Indians living in Southern Africa.